A cluttered desk is said to be a sign of a cluttered mind. In order to work efficiently, office desk cleaning is important to keep your important things organised in a best way. Having an organised work desk has many benefits. You will be surprised to see the impact a clean desk has on your concentration, productivity, and even on your ability to easily find everything you need. A little of time, discipline, and putting a system in place will ensure that everything falls into its proper place, giving you a tidy desk. This important task of organising the work desk should not be ignored – it might look simple, but counts more. Now the question is “How to clean your desk?” so once you decide that it’s the time of office cleaning or to organise your work desk, there are a 6 steps that you should follow. Step 2: Inside Out Cleaning of your Desk. The first one being, of course, to begin clearing your desk. Clear Everything On Your Work Desk. The easiest way to begin the process of office desk cleaning, and tidy your workspace is by reorganizing because organising office desk is the first step in office cleaning. Organising office desk is the first step in office cleaning. In order to reorganise, you need to start the process from scratch – this means that it is easiest if you start with a clear or blank desk. Begin by clearing everything from your desk. Remove any items that are there in the drawers (if you have drawers), and keep everything either on the floor or on a separate table. You can go through all the things later. With the clutter out of the way, you will be able to plan out how you want your work desk to look like. A clear desk is a perfect opportunity to give it a good scrub down. You can use a desk cleaner spray or even desk cleaning wipes to clean up your table inside out. Make sure to clean out the drawers as well. But make sure that you declutter your desk before you start cleaning, otherwise the existing clutter will get in the way. Decluttering is an important part of office cleaning. Go through the items you removed from your desk and divide them into two piles – one for things to throw out and the other for things you want to keep. Be firm with your choices and get rid of as many unimportant items and items that you will no longer need. Declutter the desk to the bare necessities. This process will make it easier for you to decide where to keep everything. Everyone tends to develop an attachment to things they no longer use and have no benefit in keeping them, but, they nevertheless, tend to hang on to these items. Remember, having a decluttered and tidy work desk will give you a lot of peace of mind once you carry out the cleaning. So, be firm, and let go of unused items that you are holding on to. Throughout anything that is not current. This may include old calendars, unanswered or answered mails, old photos that you no longer need, etc. Find replacements for these items. Having new and updated things will give a much-needed boost to the overall look and feel of your work desk. 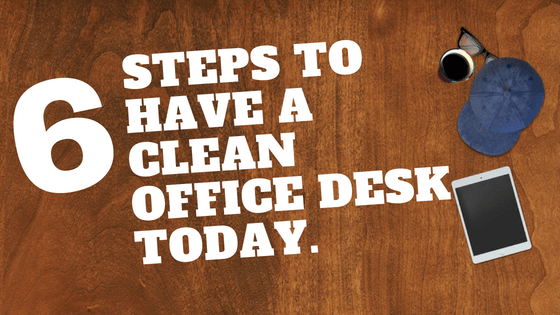 An office desk clean-up process should also include cleaning up a certain portion of your life. A person tends to spend the maximum time on an office work desk, and having a clean office desk will boost your efficiency and confidence as well. Now that your desk is ready to be put in order, the next stage of cleaning begins – reordering and managing your desk. Take some time to plan how you want to organise your work desk in order to take the maximum advantage of the space you have been given. You can even choose new locations for each item or you can just follow the same order of things as you had done earlier. Rearranging the items has a benefit – it breaks the monotony of always having to see the same items in the same places whenever you open the drawers. A big part of organising your desk also involves stocking up on new supplies. For example, if you are running low on ink, pens, refills, staples, paper, etc., this is a good time to restock your work desk. Do remember to keep space in the centre of the work desk for your computer or laptop. Keep any important documents and tools within arm’s reach so that you do not have to get up again and again. If you tend to instinctively look for a certain item in a particular position, then it is best to not change that location. Always keep a desk cleaner spray and some desk cleaning wipes handy so that in case of a spill, you can quickly and easily take care of it. Keep any items that have a potential to leak in a separate area. There are many benefits to a clean desk. Not only does it increase your efficiency and productivity, but it also gives an impression that you are in control of the situation. A cluttered desk will make it appear that you have a cluttered mind set. Sometimes, keeping your desk clean can help you reach great professional heights even. SKG Commercial Cleaning specialises in all aspects of office cleaning, industrial cleaning, including shopping centres and school cleaning services throughout Australia. At SKG Cleaning, we provide the highest standard of commercial office cleaning services in the communities of New South Wales, Victoria, Tasmania, Western Australia, South Australia, and Queensland. Call us for a free inspection of your office today. 2017 © SKG Pty. Ltd. All Rights Reserved.